No sooner had I written about the folder sharing problem between Ubuntu 14.04 VM running with VMware Player 6.0.1 and the Windows 8.1 update 1 host than VMware 6.0.2 update arrived and fixed the problem. I was able to successfully build the vmhgfs driver, after which I could mount the C:\Share folder as /mnt/hgfs/Share under Ubuntu 14.04. 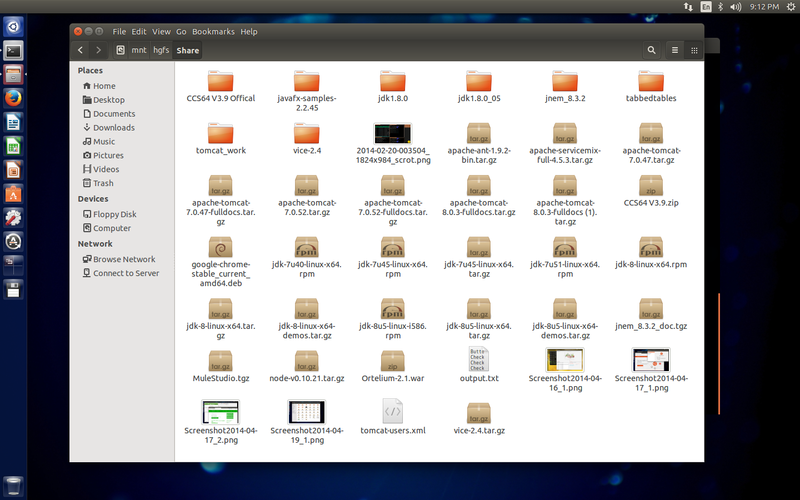 You can see the screen capture of File’s view of Share. In the last post I wrote that Unbuntu 14.04 LTS was one of the best, if not the best, operating system you can install on today’s personal computers. By personal computer I mean desktop or notebook. For other devices, such as phones and tablets (read ARM-based) I have no idea. Making some sort of sweeping claim in that domain, based on preliminary software running on preliminary hardware, is a foolish action. Let me just say that based on my experiences with both iOS and Android that Ubuntu does have a chance, although they’ll need to pay very close attention to the user experience to gain a foothold. The user experience with Ubuntu Desktop is excellent, which is why I heartily endorse its use (Richard Stallman’s FUD notwithstanding). It was Ubuntu 11.04 that started to officially begin integration of OpenStack, starting with the OpenStack “Bexar” release. Full support came about with Ubuntu 11.10 and the OpenStack “Cactus” release. It wasn’t until 2012 and OpenStack “Essex” that Redhat announced a preview for RHEL (they may have started earlier with Fedora, as I remember Fedora 18 having OpenStack in its repository system). Formal Redhat support came at the end of 2012 with the OpenStack “Grizzley” release. Canonical had started integration and support within Ubuntu a full year before Redhat. The fact OpenStack was initially developed on Ubuntu, and official Ubuntu support starting with 11.04, are big pluses for Canonical over Redhat in my book. OpenStack’s promise of an open-source cloud infrastructure free of vendor lock-in is big. But difficulties upgrading from one release to the next are a major kink that needs to be worked out before widespread adoption can begin. The OpenStack world has come in for criticism from a Gartner analyst because the claims made by companies backing the open-source project frequently don’t line up with reality. In a forthright post published on Tuesday Gartner analyst and research director Alessandro Perilli chided the OpenStack community for a lack of clarity, lack of transparency, lack of vision, and lack of pragmatism. OpenStack is touted as being an open-source infrastructure deployment and management engine that lets companies load up a free software suite to help them take on proprietary cloud giants such as Amazon, Microsoft, and Google. But besides Rackspace and HP, few public implementations of the product exist, and it doesn’t seem to have accrued the level of cash necessary for it to slow the rise of the mega-clouds. Perilli put some of the blame for this slow growth at vendor marketing (and credulous tech press reports) that have claimed OpenStack is making huge strides into the enterprise, when in fact it’s barely there at all. The criticisms line up with a recent wave of discussion that has percolated through the cloud industry as the community starts to wonder why after three years of major development the OpenStack technology is still lacking key features at its core, and why so few people seem to be making much money from it. This reminds me of my so-called early days in 2007 with Ubuntu. As I noted in the last post, I dropped Ubuntu (and Linux in general) because of the difficulties upgrading from one release to the next. Yes, those updates were a “major kink,” primarily because of hardware (read: video primarily) regressions. If OpenStack has been, essentially, a series of pre-releases with major changes in the product, then it’s a train-wreck in progress. My experience to date have been with VMware (ESXi 4 and 5), and it has worked flawlessly. When I handled an upgrade from ESXi 4 to 5, it went without a hitch. I had over 60 VMs on a small two-server stack, and nothing happened. Except it all came back up and everything continued on, as it should. I like the promises being made, but I won’t get stuck with a poor product because it’s free and open. Ideology, no matter how pure, don’t pay the bills if it leads to poor or broken products. The only way to test this out is to actually invest in some decent hardware and install the software. It may be that 14.04 LTS is the best way to get started with this. I truly hope that Ubuntu has invested some considerable effort to polish and harden OpenStack for 14.04. They seem to have established themselves on the server front, as that’s the area where they seem to be “cashflow positive.” And I take everything, both hype and hyper criticism, with a lot of skepticism. The truth, as usual, is somewhere in the middle of all that mess. I have not tried Firefox OS for mobile. And Tizen is a mess, what with Samsung having introduced three wearable product groups with Android, Tizen, and now Android Wearable, in that order.